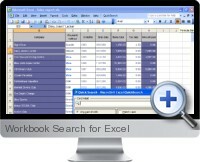 Workbook Search for Excel (Excel QuickSearch) allows to quickly an easily find data within Excel workbooks to facilitate navigation and data management tasks. The Workbook Search for Excel add-in considerably enhances search capabilities within the Excel application environment enabling to automatically filter worksheet rows which contain the queried text. Automatic filtering of worksheet rows which contain the searched text. Apply separate configurations for individual Excel files or use the default settings. Ability to edit cell contents directly from the search dialog box in edit mode. Possibility to specify Wildcard characters in search text. Adjust and configure hot keys for faster search execution.